Former NBA star and long-time Kim Jong Un pal Dennis Rodman is reportedly going to be in Singapore for the historic summit between the North Korean leader and US President Donald Trump. The internet can’t decide whether to laugh or cry. 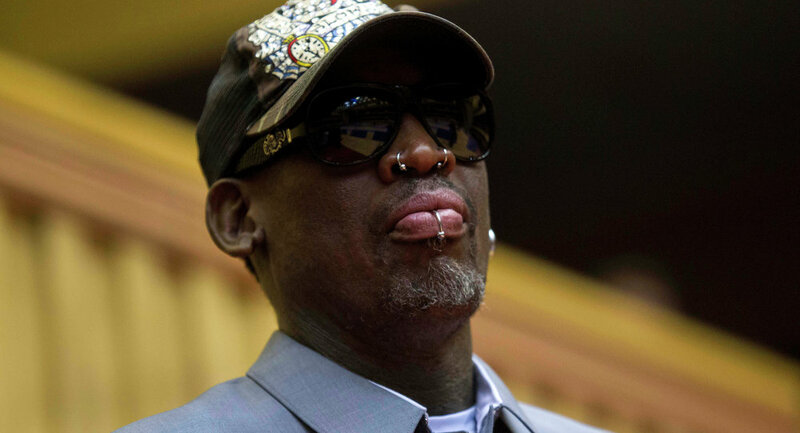 The New York Post reported Tuesday that Rodman will arrive in Singapore a day ahead of the on-again, off-again summit scheduled for June 12, and that he could even play a role in the talks. "No matter what you might think about his presence, one thing's for sure: the ratings will be huge," the post's anonymous source said. "A lot of times in situations that involve complex diplomacy, countries like to identify ambassadors of goodwill, and whether you agree with it or not, Dennis Rodman fits the bill." Rodman's representative, Darren Prince, would not confirm any planned trip to Singapore, but he said the former Chicago Bulls star would be happy to go if he could help. "He's talked about it, but no final trip or plans have been made," Prince said, according to the Post. Rodman is "just happy it's happening. He's just hoping for a great historic outcome." Rodman has taken some credit in the past for helping foster an understanding between Trump and Kim, who have been famously at odds since Trump came to power in January 2017. Rodman told TMZ in April that he brought a collection of Korean translations of Trump's books, including "The Art of the Deal" and "Time to Get Tough," as a gift for Kim when Rodman visited North Korea in 2017. "I think he didn't realize who Donald Trump was at that time," Rodman said of the North Korean supreme leader. Rodman told ABC news in December 2017 that he's visited North Korea some half-dozen times since 2013 and that Kim, reportedly a fan of basketball, treats him "as a friend." Trump and Kim, however, traded insults for much of 2017, with "Little Rocket Man" and "dotard" becoming buzzwords through their spats. The insults, however, also couched very real threats: North Korea continued developing its ballistic missile program until it could reportedly reach the US mainland, all while the US threatened to use its much more powerful arsenal, should a North Korean strike seem imminent. Renewed calm followed the February 2018 Winter Olympics, at which North and South Korea marched together under a unification flag. In March, after historic meetings between the leaders of North and South Korea, the White House announced its intention to sit down with the North Korean leadership. The planned summit was briefly called off in late May by Trump, but appears to be back on the table. Trump and Kim will meet at the Capella Hotel on Singapore's Sentosa Island resort — unless something else goes wrong between now and then.